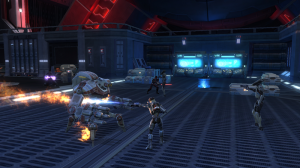 Carla and Kathy are joined this week by Ysme and Syryn from Kajidic, a PvP SWTOR guild. The four of us discussed the flashpoints updates, the many Dev Tracker posts, and the whole stock market/release date rumor brouhaha. ERTS is up 3 points since all these rumors started, so go figure. Fact or Fiction: Can you pick out the confirmed fact from the tall tales? This week’s host challenge covers SWTOR time frame and flashpoints. Kajidic Talk: Ysme and Syryn talk a bit about Kajidic and the all-female chapter of the guild, Azalus. Newsnet & Beyond: Roundup of the most important announcements and news. Gamespot interview with World Designer Jesse Sky. Changing events based on player decisions and discoveries = repeatability. Friday Update 2/4: Flashpoint Developer Blog. Jesse: thumbs down on trash mobs and strict linear progression. Dev Tracker: Georg Zoeller addresses concerns about server faction balance. Metrics tell them that in testing, the split between Republic and Empire is pretty even. Also, players are relatively unaffected by the Next New Thing syndrome and do not, for instance, respond to a cool class video by switching their preference to that class. Release date kerfuffle. Recap time! Mike Hickey says investors are betting against SWTOR. Brean Murray Carret & Co. downgrades EA. MCVUK.com claims that “development sources” are whispering about a September release. Unfortunately, they also mention EA Louse and the unsubstantiated $300 million figure, which makes people think that their report is based on an anonymous blog. Also, they cite EA Louse as a BioWare dev, which even EA Louse did not claim to be. Interestingly, all references to EA Louse and $300 million were later removed from the online article. At EA shareholders meeting (thank you TOR Syndicate for the audio) CFO Scott Brown and CEO John Riccitiello debunk the $300 million figure, and say TOR will be released between April and December 2011. Stephen Reid repeats this release date window on the announcements section of the official forums. Suddenly, Spring 2011 feels a little iffy. Dev Tracker: Georg Zoeller talks about auto-attack here, here, and here. Dev Tracker: Daniel Erickson talks about the time frame of SWTOR here and here. Where’d the space combat trailer go? Advanced Class Respec? Significant majority says no switching between advanced class choices. To Ysme and Syryn from Kajidic for appearing on our show. To The Fish76 for leaving us a review on iTunes. To our sponsor, Guild Launch, the place to go for all your guild web-hosting needs.